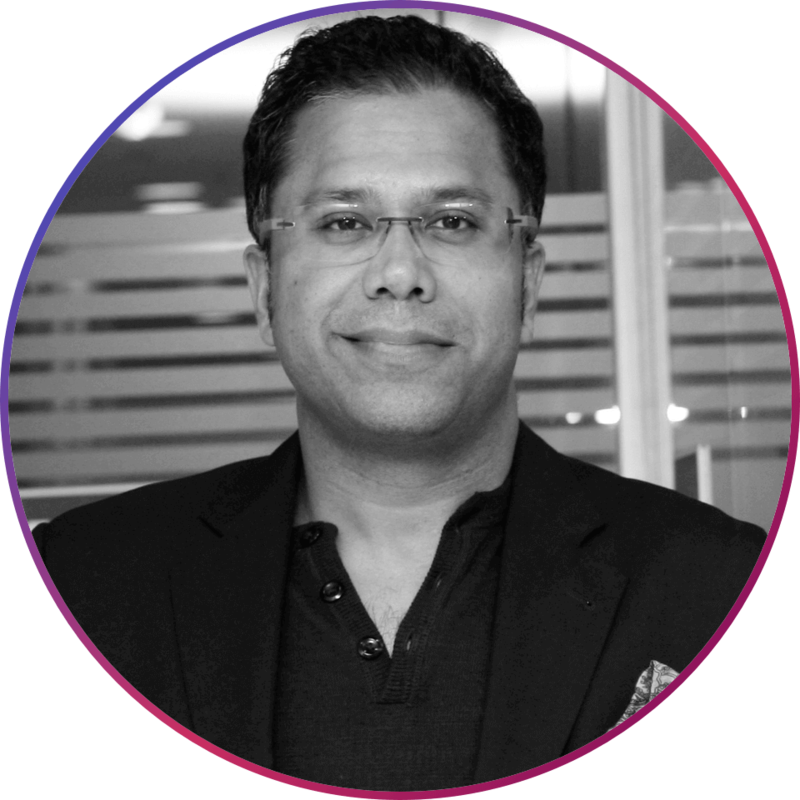 ALTBalaji is a Subscription-based Video-On-Demand (SVOD) platform and is a fully owned subsidiary of Balaji Telefilms Ltd. Available across multiple interfaces ranging from desktops, laptops, tablets, smart-phones, game stations to internet-ready television, ALTBalaji marries state-of-the-art technology with gripping storytelling. They are one of India’s leading Over-The-Top (OTT) media players with over 100 hours of original content belonging to a wide variety of content categories. As India progresses steadily to the maturity stage of the smartphone era, the confines of closed-room television viewing have started to disintegrate. Fuelled by access to better tech and the proliferation of 4G mobile data, consumer behavior is evolving. Consumers want video-on-demand on their smartphones, personalized to their tastes and preferences, devoid of advertisements with full control over the multimedia experience. This behavior is not unique to urban millennials or the generation Z brigade. It has penetrated deeper into older age groups with the emergence of multiple OTT players and new, varied content. According to KPMG, there are currently 200 million online video viewers which will double in the next 2 years. The opportunity is ripe for OTT Media to shine. ALTBalaji realized the high-intensity impact of content consumption early on. They wanted to drive User Retention and ensure that users who landed on their platform or downloaded their mobile app view the platform’s video content. For this, they enlisted the help of WebEngage’s Marketing Automation platform to create intelligent User Journey campaigns. Here, we will be analyzing a journey that ALTBalaji ran to increase the video views for users of their Android mobile app. Once a user installs/ upgrades the app, this journey gets triggered for them. It has been designed for the sole purpose of maximizing platform video views. 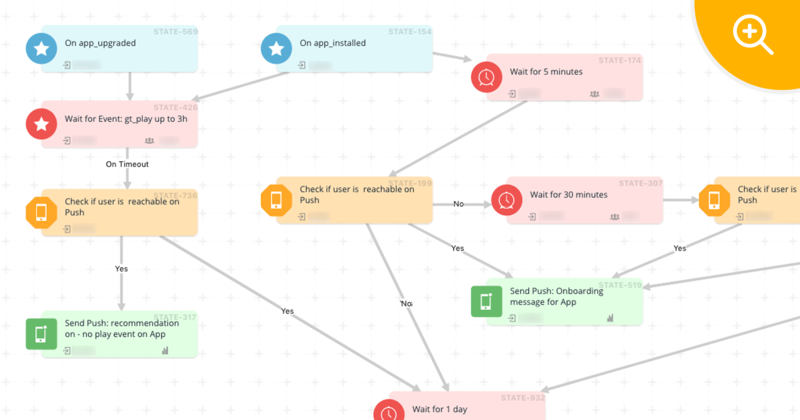 The journey employs a two-pronged communication approach to user engagement: Push Notification & Email. The aim is to pitch high-rated content to users who haven’t played any video so far after installing/ upgrading the app. The base logic is to expose users to their content and create a need in the user to consume more content from there on. Users would want to stay on the platform for longer and keep coming back in the long run to consume more video content. 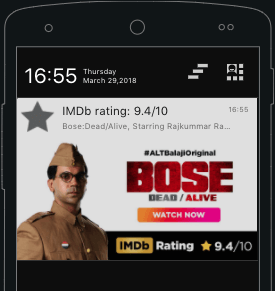 It promotes the platform’s flagship show to the user with a strong visual notification, highlighting the show’s exceptionally high IMDb rating. These were individually unique push notifications that went out in both entry points. Now, the journey unifies both entry points with an email campaign. If the user is not available over an email, then the journey ends for them right there. Now that the journey has been explained, let us take a look at some of the numbers for the month of January & February. This particular journey was started in February, which is why we will be directly comparing the stats from that month with the numbers from January. According to certain research reports, apps are bound to lose over 77% of their DAU (Daily Average Users) in the first 3 days. ALTBalaji managed to counter this known issue with their elaborate User Retention strategy powered by WebEngage’s Journey feature. One month into running the Journey, the results started flowing in and retention numbers started climbing up. The contextual, timely nudges deployed by the platform enhanced engagement on the back of intelligent triggers. This not only increased the possibility of user engagement but added more value to the user experience by creating a relevant, guided flow for users. We studied the cohort performance to understand the effect on day-wise retention numbers. We analyzed the Cohort’s Retention percentage for the months of January (before starting the Journey) & Feb (after starting the journey). This basically represents the percentage of users who installed the app and came back on the respective days to carry out the return event, i.e. played a video on the platform. 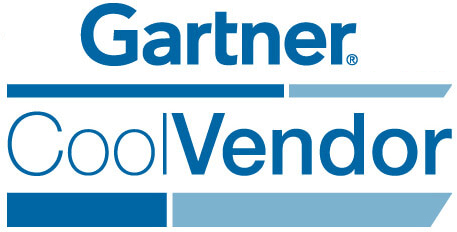 The Implementation of Journeys was instrumental in increasing retention rates for the brand. 1 month after starting the Journey to increase video play event after app installs, ALTBalaji witnessed a significant increase in the Day 1 to Day 7 retention percentages. 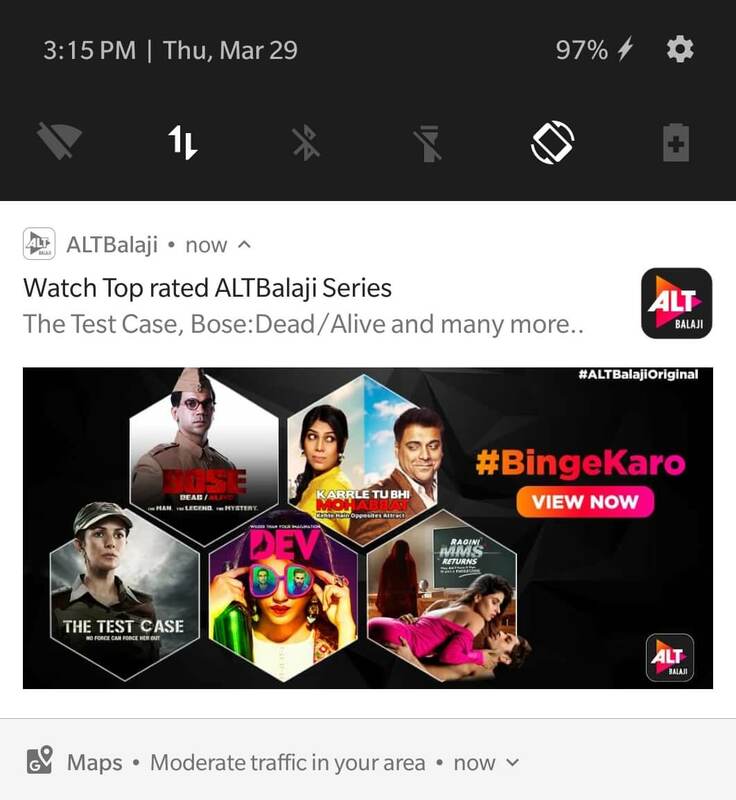 By leveraging contextual nudges via Push Notification and Emails, ALTBalaji managed to increase user engagement intelligently and drive more users into playing video content on the platform. A control group experiment confirmed this, with the focus group managing to garner higher conversions powered by the WebEngage journey, as compared to the control group that wasn’t exposed to the Journey. The journey that they ran helped them get a 9.51% uplift in terms of their conversion event, i.e. Video plays. “Keep them coming back for more”. 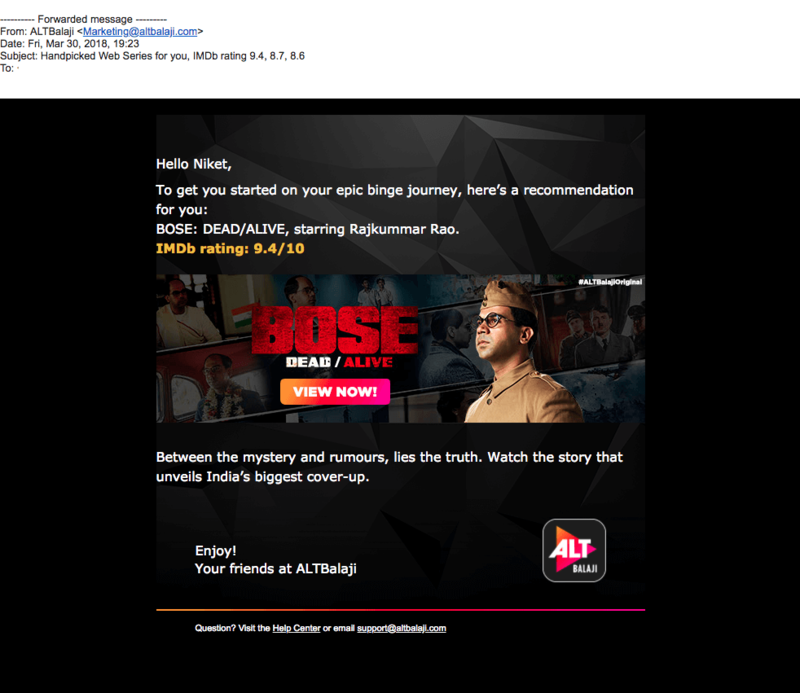 That’s what ALTBalaji set out to emulate, and they have managed to crack the retention problem rather effectively with the intelligent use of Marketing Automation and contextual engagement.